Early evening light drips through the giant windows of the tour bus and we lean our heads against the glass. We’ve spent the morning at the Grand Mosque in Cordoba and now, as the sun slowly makes its way across the sky, we wind our way up a road that twists round hills of dry earth. 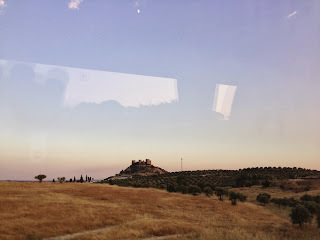 We are just outside Cordoba en route to a family farm in the hills, where the Almodovar community of Spanish Muslims are hosting us for salat al-maghrib (evening prayer) and dinner. As the bus heaves up the hill, I place my hand against the glass and feel the warmth against my fingers. 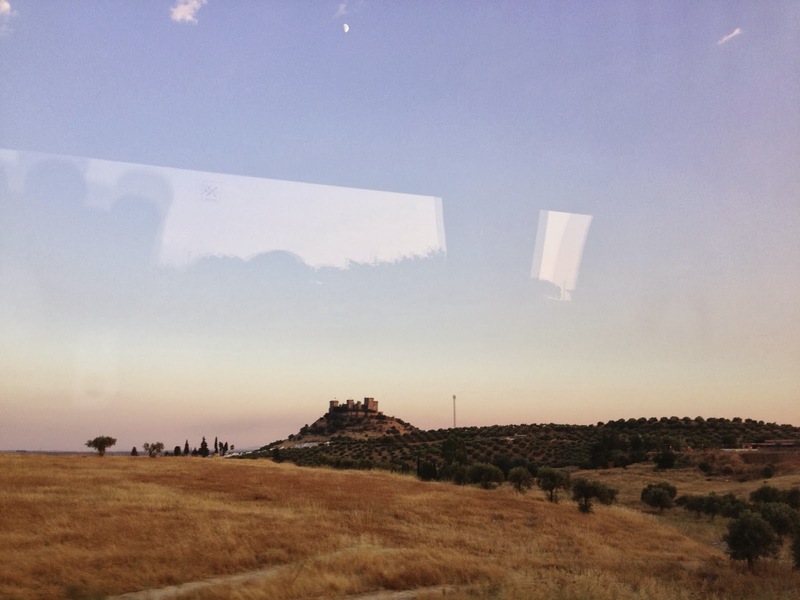 I hardly know where I’m being taken, but this sense of submission, of being lead to where you need to be, no input required, is liberating.”Look up there — ” Our guide, Tariq (from Andalucian Routes), points to the hills. We shift in our seats and follow his gaze. The skies are already yellowed from the onset of evening. “Do you see that building? That’s Madinat Al Zahra — that’s where we’re going tomorrow.” Tariq holds the microphone loosely in his right hand and there’s a furrow in his brows as he explains how we will visit the ruins of a palace built by Abdur Rahman III, that we’ll walk through the remnants of what was once the most functional, advanced, and prosperous city of its time.Tariq has a particular way of speaking that even on this — the second day of our travels — I’ve come to enjoy. He is impassioned, but not overbearing. His accent doesn’t have the grating edge of a posh Londoner and though I know he’s from Birmingham, his intonations are soft, but quick, one word kicking into the next in quick succession. Combined with his placid demeanour, his voice has the unique effect of simultaneously engaging and calming you. I scan the hills–mounds of green shrubbery dot rippled earth that alternates from ruddy brown to light shades of dry brush. I spot a sprawling building perched against the rocky cuts of earth — its walls are a soft, butter yellow and the ledges are carved into delicate motifs that seem to scrape gently into the surrounding scenery. I glance around the bus to see if I’ve spotted the right structure and as if reading my mind, Tariq leans over and looks out the window. “No–no–not the monastery. That big yellow building is the monastery. There — up, on the left.” He points again and as I shift my gaze, the bus rounds a curve and the view is lost. Shaykh Abdullah Hakim Quick sits at the front of the bus, just in front of where Tariq now stands, and when Tariq pauses, he turns in his seat and speaks to the group. We are immediately attentive. As anyone who has grown up listening to the Shaykh’s lectures knows, his measured, but direct manner of speaking has the effect of making you pay attention. Every sentence seems to have a push of energy behind it, an intensity that exhales into a state of awe–it’s as if he is always marvelling at how things are and how they could be. “Madinat Al Zahra is the point when the idea of building palaces for yourself, the idea of a leader somehow deserving a palace–this marks the beginning of a loss of imaan (faith).” He nods, his glance flitting up the aisle, then resting at some distant point out the window. He turns back, handing the microphone to Tariq. Already, there is a sense of loss that accompanies each site we visit. As the bus lurches on, up this winding road that seems to curve on and on into the burning horizon, I have the distinct feeling of being placed in a story, of knowing what it truly means to be a traveller. You step forward into new landscapes with your chest split down the middle, your ribs yanked open like a gateway. The good — it flows in easy and you walk on eager, chin lifted to the sun. But to lead with an open heart, is to walk forth vulnerable and exposed, every branch in your path scraping your heart raw, every moment you experience taking hold and not letting go. And though this can injure, I think there really can be no other way to travel — not if you want the experience to be more than fleeting. We have moved deep into the hills and as the bus curves round, we see the first signs of the village — lines and lines of whitewashed houses stacked like lego bricks at the base of a hill. Tariq points out the window again, half smiling. 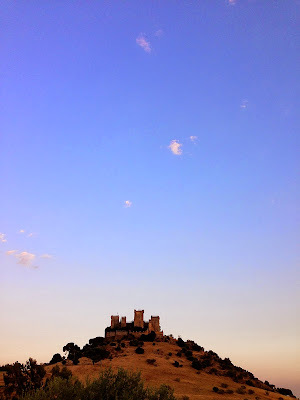 High up on a hill, rising up from the earth like an ancient fairytale is the Almodovar Castle. Built by Muslims in the year 760, it was lost almost five hundred years later to Fernando III in the year 1240. It stands today on one of the highest points of the landscape, perched like a crown against soft sighing skies, a testament to the way history will unravel itself in slow, but deliberate turns, every catastrophic loss a pinpoint on a map we can only see in fragments. There is perfection, but we see it in hindsight; we hardly recognize the light or the beauty until we stand at the very edge looking back. It could not have happened any other way. The eastern sky sighs from blue into white and we circle round and round, higher, then deeper. We snap pictures, our shoulders pressed up against the glass, the reflections in the window showing up as gleaming streaks in our photos, the flashes from our cameras as flaring, artificial moons. The bus pulls to the side of the road and exhales, slowing to an abrupt halt. Cicadas — we are off the bus and trekking down a wide path of hard-packed dirt into a deafening cacophony of shrieking cicadas. 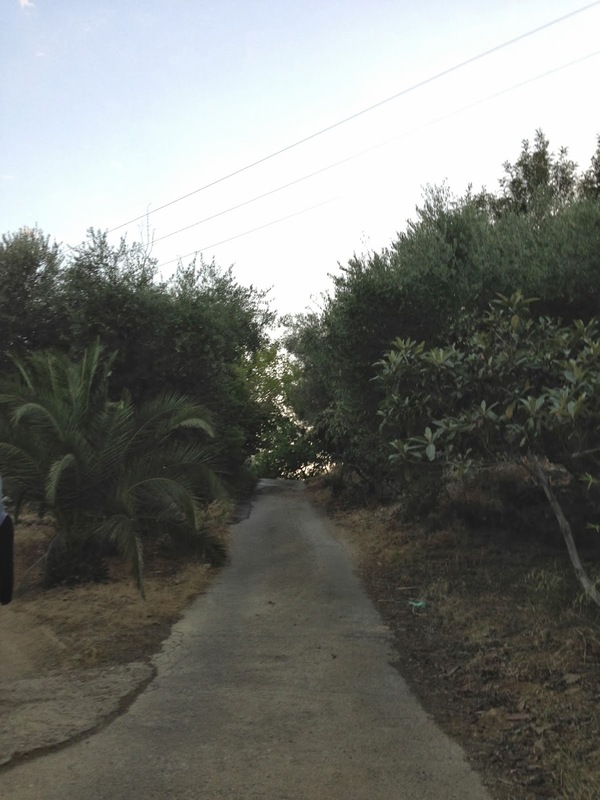 The path is lined with thick vegetation — short, stubby pomegranate trees with nubs of small fruit, low draping branches of olive trees, the giant, dinosaur-like aloe vera that looks monstrous enough to eat you. The incline of the hill is not severe, but we are breathless once we reach the clearing. Here, the rest of the group has already gathered. Tariq stands next to a young man — he is slight, his features gentle. He smiles wide. The horizon deepens to rust and we climb an iron staircase that leads to the rooftop. From here, we stare out at the plains where lines and lines of olive trees roll over the dry earth in calligraphic strokes of brooding green. We lean over the railings almost breathless — the sun burns low behind the hills and the sky sinks from bright white to purple shadow, the air still. And all the while, cicadas buzz like electricity in voltage lines — everything seems electrified. We take turns posing for pictures with the backdrop of the castle behind us and at sunset, a hush spreads through the group. The adhan, quiet amidst the hum of the cicadas, undulates outward into the plains, or emanates from it — it seems part of the landscape, rolling out from the earth itself. The call to prayer is just a human voice that beckons people to submit. To come, acquaint yourselves with success, to walk forth in the name of your Creator, to press your forehead against the earth and know with certainty that He made you. That your heart, that nub of flesh that winds in upon itself in hurt, in grief, in anger, in rebellion, in abandonment, in hope — that your heart is made by Him and He knows, He knows. Every pulse of pain that makes you cave inward — He knows. Every grief that has you press your hand against your chest to dull the ache — He knows. And the adhan — it calls you to Him, to return again and again and again to the one thing that will relieve and revive you, to the one thing that will carry you through. The group slowly files back down the steps to the mussalah (a dedicated prayer space) to join in congregational prayer. I turn back and rest my arms on the railing — I know that this was written for me, for each of us. To think that He wrote this moment for me — standing on a rooftop in the plains outside Cordoba, me and these brilliant burning skies — to think that He put each of us here so we could speak to Him, so we could bear witness to the perfection of His plan — is this not a blessing? Is this not mercy? The sun has sunk low and the horizon is ink against the fire of the sky. I am alone on the rooftop and the cicadas still hum, their buzz like the white noise of rainfall all around me. I hurry down the steps to join my companions. Stay tuned for Part II of our visit to Almodovar.